Maintenance for your AC Kissimmee commercial unit is crucial to its regular functioning. With maintenance, you can catch any potential issues early while also preventing future problems. Learn more about what steps you can take to maintain your commercial air conditioning. By keeping up with air conditioning maintenance, you can catch any minor issues before they become serious. Most problems that affect AC units don’t have obvious signs, particularly not ones that someone without a knowledge of HVAC systems will understand. Since you are unlikely to notice an issue until it becomes complicated and expensive to repair, having your technician complete regular maintenance increases the chances of discovering a problem early. Because regular maintenance can help you catch problems early, you have less potential for downtime. Depending on your company, you may not be able to remain open if the air conditioning is not functioning, especially in the Florida heat. Regular maintenance means your HVAC technician can catch and repair any issues early, so it’s less likely that you’ll suffer from downtime. Regular maintenance of your air conditioning unit will also do wonders to improve its efficiency. After all, when everything works properly, the unit uses less energy. This is important, as commercial air conditioning systems tend to be one of the most energy-consuming pieces of equipment in a business. Improved air conditioning efficiency can lead to a decrease in your monthly electricity bill. As with any other piece of machinery, maintaining your commercial air conditioning unit will help extend its life. Because you can catch any issues early, the chance that an issue cannot be repaired decreases. Additionally, components that run as expected last longer. Think of maintenance as the equivalent of your annual checkup with the doctor, but for your air conditioning. 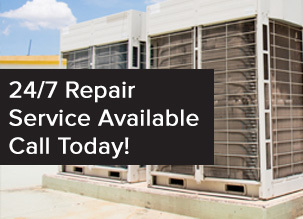 When it comes time for maintenance on your commercial AC Kissimmee, let All Temp take care of it for you. Give us a call at 407-857-7800 or 813-630-9400 to make an appointment for regular maintenance or any needed repairs.